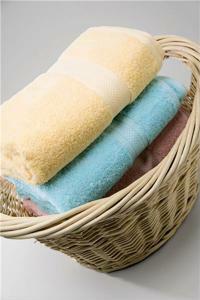 Towels used to have one purpose - to help dry you off after a shower or bath. These days however, they're being used to provide a decorative touch to any bathroom. If your bathroom is looking rather drab with too many neutral tones, a set of towels on a towel rack can easily bring in a pop of color and breathe life into the room. You can layer different colors and sizes to create an interesting scheme, and can carry this idea on to other bathroom accessories, including the window treatments and the shower curtain. Beside a towel rack, you can make use of the counter space of your bathroom vanity to showcase rolled pieces of towelettes for a look reminiscent of a luxurious spa. If you have space on the floor, you can even add a beautiful woven basket into the room and fill it with some knickknacks, like colorful soaps and extra towels, that guests can use when they come for a visit.